HashTable::getString() now escapes names with spaces in ""
handling of 'A' ASCII char constants in scanner fixed, e.g. "print 'a'+'b';" works correctly now (should print 195), notice that "print ' a'+'b ';" will print " ab "
*thanks very much* to Bastian Zühlke for donating a PowerPC Macintosh G3 233Mhz (PPC750). (another good reason to update tkSDL 2D caps and a good opportunity to port the JIT). The machine seems to be too old to run MacOSX so I installed Linux which is a real fresh breeze for this "old" (1996) hardware. added support for local variables. See testlocal.tks and fibonacci.tks.html examples. please beware: the JIT compiler cannot access "interpreted" local variables since JIT locals are directly placed on the CPU stack. Good news everyone :) ! I just read on /. that Microsoft is now giving away their (very good) Visual C++ compiler suite for free (command line tools). So I took my time and added a makefile.msvc which requires Cygwin and vctoolkit2003 to be installed. here is a tks binary compiled with Microsoft C++ Version 13.10.3052.
updated equ plugin. uses new plugin interface now. added makefile.linux. updated tksidplay2 plugin. added makefile.linux. note: the tgclso benchmark times were measured using perl v5.8.0 (cygwin), java 1.4.2_04, gcc/g++ 3.3.1 (cygwin) and visual c++ 6.0 on an AMD 2400+ with 512MB RAM (using a Nvidia NForce2 based MSI board) runnning Microsoft Windows 2000 pro. rewrote file/stream classes. removed C++ "iostream" code and replaced it by its ANSI-C equivalent. The File class can now read from "stream" like files (size=0), too..
added quick'n'dirty hack which outputs the xfer speed of a network interface by reading from the /proc filesystem (uses a timestamp file). added: "print" statement. similar to "trace" (which outputs to the debug console), "print" outputs to stdout and adds a newline if necessary. bugfix: YAC_New_ListNode() macro returned a new treenode..
YAC_OBJECT_TAGS is now defined by default. this adds another sizeof(int) bytes field to the YAC_Object class (so its now 2*sizeof(int) bytes in size). The field is used to determine whether the object is still valid (YAC_VALID_TAG (=0x900DF00D) and YAC_INVALID_TAG (=something else, e.g. 0xD34DBEEF)). This makes it easier for the engine to detect already deleted objects. Also see this example. core::added: default array size for array members of classes..See this example. yac: ying.tks name mangling fixed (now works for functions, too. also only the leading '_' char will be removed, so "_Say_Hello2" becomes "Say_Hello2" in the script engine. started to rewrite the core API to work with the new (faster and easier) plugin interface..
(very) good news everyone! I designed a new plugin interface ! directly scans your header files so the cryptic "#defines" are now obsolete. the drawback is that you need to run a preprocess script (ying.tks) before you can compile your plugin but that's probably a lot more convenient than the old c++ preprecessor script which took ages to compile with gcc/g++. there is almost no need to write any "script wrapper" methods yourself. this is now all handled by the "YIng" interface generator. The only exception are overloaded methods (this may change) and variable return types but that should be quiet obvious. very (!!) few (no) dependencies, designed close to "C". fully supports the C++ runtime, i.e. virtual methods etc..
no compiler specific hacks or inline assembler required!! how could this happen? here is the missing tkopengl.dll! new tkopengl plugin release 0.6.2.8 (Win32,Linux (no makefile yet) and maybe others..
new tksdl plugin release 0.6.2.8 (Win32,Linux (no makefile yet) and maybe others..
the tkopengl and fox plugin sources currently only contain microsoft visual studio c++ 6 project files. makefiles for linux & friends will follow asap..basically you just need to compile all the *.cpp files and throw them into a dynamic object, e.g. "g++ -shared -Wl,-soname,tkopengl.so *.o -lGL -lGLU -lX11 -lXext -lm"
working on the FOX/FXML plugin! initial test-release of the FOX GUI plugin. An XML like markup language (working title "FXML") allows you to create graphical user interfaces as easy as web pages. You can directly write script callbacks in your .fxml files but it is encouraged to encapsulate source code from GUI descriptions if you plan a larger project. See an example script here (fxml file). => pixelfont module works again, debug font does not appear when using multiple textures..
ported the JIT to Motorola MC68040. See screenshot here (rotzoomer, 256x256x32bit, 1000 frames. 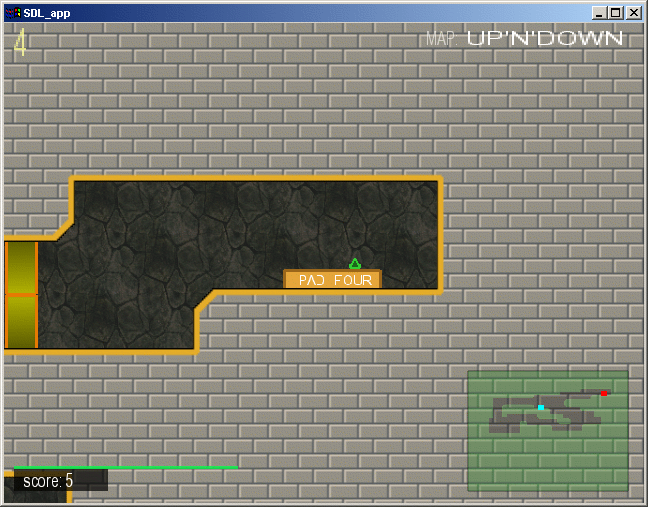 screenshot taken using the UAE emulator which was configured to emulate a 68040 as fast as possible on a 2400+ AMD. 3 p.m.: removed the ixemul.library from the lha distribution and included the list bugfix. Amiga users should download the latest ixemul e.g. here or here. a lot of cleanup and various fixes/improvements!